Ambient lighting isn’t just installing light fixtures, plugging in a lampshade, or clicking the switch. It’s a technical and complex part of interior design. 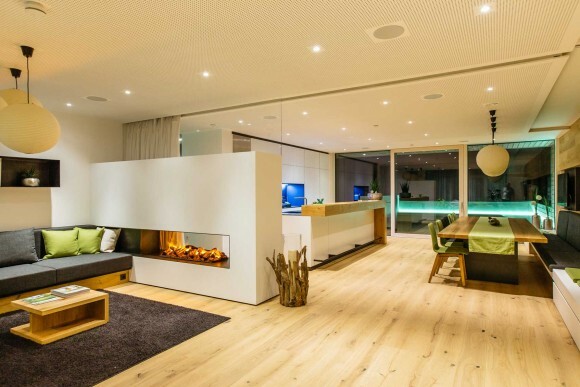 You need a plan the combination of natural and artificial lighting inside your house. If it’s not properly lit, your health is at risk. There are numerous ways to achieve proper lighting. But before you go and start doing these things at home, you have to understand what kind of light you need. Light has a color temperature, which is measured in Kelvin (K°). Basically, the yellowish lights are warmer while the bluish ones are cooler. In the photo below, you’ll see how light can impact a room. Use the warm bulbs as primary lighting in the bedroom to make it cosier. On the other hand, install cooler lights in areas where attention to fine detail is required like in bathrooms, garages, kitchens, home office, and study areas. The light in between will work in living and dining rooms. As a designer, we don’t follow hard and fast rules in lighting. You need to test to see which looks best to you in each fixture in the house. Again, ambient lighting happens when there is a balance between natural and artificial lighting at home. The best way is to invite daylight in your space and allow artificial light to fill in what’s lacking. In the homes in northern hemisphere, east, west and south-facing rooms receive a decent amount of natural light. In the south, only the north and eastern rooms enjoy it. These are the areas where you should install windows and glass doors. Depending on your country and state, creating huge windows and installing glass doors might need building permits. Double check with your local or country building codes for guidelines. If you want, you can personally process papers or hire a firm who also handle council approvals. For example, we have strict building codes here in the state of Victoria in Australia which is why most homeowners seek a Melbourne draftsman who knows how to deal with the building requirements set by the government. Maximize natural light in your home using mirrors and other reflective surfaces. Hang a mirror on the wall opposite or perpendicular to the window. The light entering the house will bounce as soon as it reaches the mirror, recycling the light and illuminating other parts of the room. White paint best tool to make a room brighter but don’t repaint that room all-white just yet! Our local Brisbane architects suggest that you inquire about a paint product’s light reflectance value (LRV). Professionals use it to measure how much a colour absorbs and reflects light. Basically, lighter colours reflect more while darker ones absorb more. Glossier paint reflects more light as well. This is the reason why you can never go wrong with white or any light colour in small spaces. Recessed lights are light fixtures installed in a hollow hole in the ceiling. It’s the most popular solution to a room that needs ambient lighting. It allows you to do zone lighting, wherein you turn off light in areas not in use to control levels of brightness in a room. In using recessed lights, you have to remember that the distance between the cones is based on the height of your ceilings. To know how far apart your recessed lights should be, just divide the height of the ceiling by two. If a room has an 8ft. ceiling, your recessed lights must be approximately 4ft. apart. If the ceiling is 10 ft. high, put about 5 ft. of space in between each fixture. Also, make sure to install recessed lights approximately 3ft. from the wall. You don’t want to cast shadows on the wall for this makes your ceiling appear low. Dimmers allow you to control your lighting from day to night, for various events, and depending on your mood. It’s not everyday that you need a living room that is lit like a stadium. Also, not everyone enjoys a bright room. People are sensitive to light for different reasons—some because of their age or medical conditions. If some members of your family suffers from light sensitivity, dimmers shouldn’t be missed. At the end of the day, ambient lighting is about your comfort in your own home. Some people enjoy light-filled spaces while others find peace in a cave-like homes. Everything in your home should appeal to you. Lighting design is here to enhance that.